Your wedding is a special day and with all focus on you, you surely want your hair and makeup to be perfect. Enhance your natural beauty at Rancho Bernardo's Plaza Hair Salon, where we offer you the best wedding packages and services in San Diego! Our well-trained stylists will pamper you with professional hair and makeup products by renowned cosmetics manufacturers such as MAC, Laura Mercier or Bobbi Brown. Our goal is to create a look that radiates beauty while highlighting your features and the look that matches your individual needs. If you desire a glamorous look for your wedding, make sure to schedule an appointment because some hairstyles can take up to 5 hours depending on the client's hair texture and length. 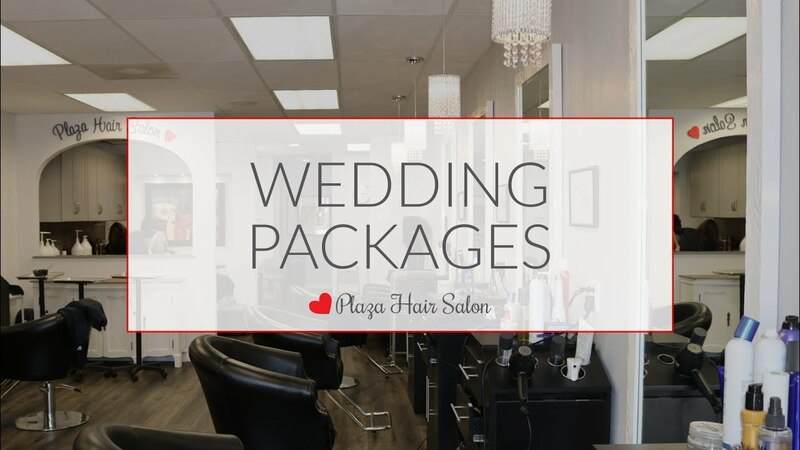 Choose Plaza Hair Salon for your wedding hair and makeup for a stress-free and enjoyable experience! We recommend consultations for hair and makeup to ensure you and the stylists have a plan for what you need. Call early to ensure you get the appointment time you desire. We recommend scheduling your appointment at least 6 weeks in advance. Confirm or cancel 48 hours before scheduled appointment. Day old, clean dry hair is best for bridal/event styling. Everyone in the bridal party should wear something easy to remove. For your wedding transportation, we recommend Aall In Limo & Party Bus, a trusted vendor that was recommended by our brides and bridesmaids as being the top luxury limousine transportation choice for and San Diego based wedding venues and locations.